I just finished playing an extremely dirty recreational playoff game. It was the kind of game that makes me dislike hockey. The hockey I play is as recreational as recreational gets. No one is going to get a college scholarship. No one will play for the Olympics. No one is even going to make a provincial team. Now, I get it. Teams who don’t have speed have to hack and slash to survive. My team on the other hand is built upon a ‘first to the puck’ mentality. We have no one on our roster good enough to dominate a game; therefore, as it should be, we win and lose as a team. This particular team we played tonight we also played a week ago in the final game of the regular season; we won 8-2. We just so happened to draw them for the first two games of the playoffs. Our team expected a hacky game but what we ended up participating in was absolute lawlessness and a perfect example of why The Code doesn’t work. It all started with a cross-check in the corner on our defenceman. Face-to-face race for the puck and their player took two hands to her chest. The ref was standing right by our bench so I asked, “Is that not a cross-check?” Of course he ignores me. Our team then retaliated with a cross-check to the back of the original offender. No call. And so it continued. A cross-check from their team to the back of my line mate straight into the boards. 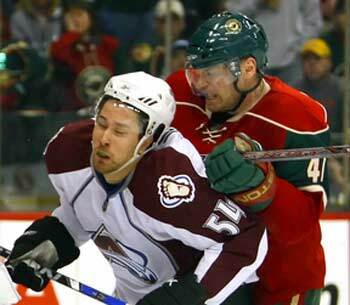 It’s the type of hit that would start a fight in the NHL. I was in close range and took exception to the dirty hit to my teammate and friend. The offender had tumbled after her cross-check so all I could do was slash her in the pants. Retaliation is far from part of my game but, I think like many hockey players, a little switch goes off in your head when you see someone take liberties with your teammate. I’m not proud of retaliating and I expected a penalty for an obvious non-hockey play but no whistle came for either play. Late in the third period when we were up 5-1 they took out the skates on our player with a blatant trip. On the ensuing power play #77, responsible for a number of dirty plays, cross-checks one of the smallest players on our team into the boards. Our biggest player then goes over and pounds on her a bit. Both benches are up in arms. With a player in each box and 23 seconds left to play I was hoping they would just run the clock so the madness could stop but no, one more face-off which led to one more cross-check. Needless to say the hand shake line-up at the end of the game was one of the more disingenuous versions. Welcome to women’s recreational hockey! After the game, our ‘goon’ said to our goalie “I know you didn’t want me to take a penalty but I had to send a message after that hit.” And there it was, a manifestation of The Code in the furthest realm of hockey from the NHL. I realize that all of the retaliative plays were The Code in action but it was that phrase “send a message” that really brought the sociologist forward. Sadly, I think Don Cherry would have been proud. I think he would have thought it was hockey players just working it out on the ice. But what I saw and experienced was lazy referreeing and lawlessness that detracted from the game that I love to play. I suppose one could argue, well if there were really a goon on either team no one would be taking runs at players but if that is the purpose of the goon/enforcer then what is the purpose of the referee? If the purpose of referees in the recreational game is to drop the puck and get in the way of good clearing attempts up the boards then thanks but no thanks. In the NHL, they don’t even drop the puck so they serve even less of a purpose if the game is supposed to police itself. What was particularly interesting is how, through my research, it has been argued that The Code is learned through junior hockey in the Canadian system. Yet, none of these women have played junior hockey and The Code is entrenched within our understanding of the game. No one has to tell us to stand up for our teammates, we just do. No one has to tell us that one cross-check deserves another. We could argue that this is learned behaviour from watching NHL hockey but I think it is more than just re-enacting what we see on Hockey Night in Canada. As I said before, a switch went off in my head and sensibility didn’t matter in that moment. It was visceral. The problem with such a method of ‘control’ is that there is no control, it is merely chaos until the clock runs out. As much as we would like to believe that players can govern themselves they cannot. Just as civil society is, unfortunately, unable to govern itself there needs to be some rule of law on the ice. I can only imagine what our game looked like to those watching. Not hockey I’m assuming. Just like a bench brawl in baseball, although amusing, these aberrations do not define baseball. But for hockey retaliatory plays are the norm and they are very much part of hockey culture. It is also the worst part of hockey culture. It does not enhance the game, it makes the game a mockery. There is something to a learned behavior, partially in regards to the players, and partly the refs. Unlike economics, behavior on the ice is a bit trickle down. The rules trickle down from league to league (icing, puck over the glass, etc) and sometimes the other way (shootout). I suspect refs, in general, see how much punishment a body takes, and applies that to their calls. You didn’t get cross checked that bad, so you don’t draw a call. My thought is that it’s like storytelling: You don’t have to be a screenwriter to recognize a three act story structure. But if there is something more to The Code, something that transcends skill, gender, or environment, perhaps it’s based on a sort of morality. Eye for an eye, justice of equal type, etc. The scale may be different (you wouldn’t just cross check someone on the street), but there is something moral in the behavior here. You hit a bully back, because that is the only tool you have, and it’s the only ‘right’ response. In a recent rec game, I wound up finally getting ‘revenge’ on someone who cross checked me in the ribs the last time our teams met. I wound up side by side with them battling for the puck, and they had inside position on me. I took the opportunity to shove them away (and down to the ice), with a few choice words for them. It was ‘payback’ and establishing dominance. And it felt good. It was push back for a previous infraction. The morality was that someone else did something wrong, and they were wronged back. That may not have been the clearest of messages, but I was also sending myself a message. I wouldn’t be messed with. Whatever The Code is, you know it’s there for a reason. I think you are right in exploring it. Good post. Thanks for reading and commenting. Yes, it does feel good to dish out a little pay back on the ice but whether that is right (morally or otherwise) is a different story. The Code facilitates and encourages vigilante justice in hockey, which is where it all goes crazy. As much as I enjoy the thought of a Dexter Morgan or Batman running around taking care of the bad guys that elude the traditional justice system we aren’t allowed to take the law into our own hands for very good reasons – not everyone can be trusted with that kind of power. Now, arguably the law itself is problematic but as a form of governance it is supposed to be there to maintain civility rather than settle scores. And the Code isn’t about fairness, it is about retaliation. Penalties should be enough to settle the score – on the scoreboard – but Greg Moore was a marked man until someone made him physically pay. A few minutes in the box wasn’t good enough and everyone knew that. As we saw, not everyone can be trusted with that kind of decision making. Does that make it right? I’m ambivalent about that. On one hand, you are right, the power shouldn’t be handed to every single person, even though mutually assured destruction does have it’s benefits. But then again, there wouldn’t be a need for Batman if the rule of law was carried out in the first place. So someone cross checks you. They broke the rules, and it goes unpunished. Much like any bully, they will do it again, until they are either punished for it (and since they got away with it in the first place, they might not take that seriously), or until you stand up to the bully. Playground rules? Barbaric? Perhaps, but it also works. Retaliation? Maybe, at times. I think it’s more about, “you can’t do that to us,” establishing that some wrong happened, and that it won’t go unpunished. My own ‘revenge’ was for me, establishing that the action that player took wasn’t going to go unpunished. Did it work? Probably not. But it did have, in my opinion, it’s place. Much like your switch has it’s place. That’s why it isn’t on all the time. In the case of STEVE Moore, things got out of hand. And the reason it got so bad was that players ignored The Code. Especially the player that sucker punched him. The regulation of The Code is what makes it work. And when that layer isn’t followed, you have horrible incidents like that. I don’t think you are genuinely comparing your game to the Bertuzzi / Moore incident, but I understand and agree with that point, even though it is the most extreme case that has existed to date (And keep in mind, that’s coming from a Colorado Avalanche fan). I would point to someone like Raffi Torres first as an example. Or an even better argument could be made about ‘clean’ hard checks and the fights that happen after. Those are ridiculous, and I consider them a perversion of The Code. So am I defending The Code? Frankly, I would rather have some sort of code than not have one. I don’t think fighting is as effective a deterrent as it once was, and I think the ‘momentum changing’ fight should be a thing of the past. I think enforcers are less useful now than they were even a decade ago, and that’s a good thing. More interesting to me is that a Code exists (capital C code) and doesn’t have to be written down and agreed to for people to understand. That’s why I think it is based in morals, more than anything. haha, yes Steve Moore…not the race car driver. You bring up some great points. The problem with the “you can’t do that to us” mentality is that it is very similar to gang mentality. A demand for respect and space that turns into anything goes. According to Mark Messier and his research, 90% of Canadian families are preventing their children from participating in hockey with player safety being one of the main concerns. I think we have to be honest in acknowledging that vigilante justice or The Code, whether they are justified or not, make hockey a scary game for many. What they see are bench brawls and fist fights and maybe they don’t understand the context but does the context really matter? Frankly, what I experienced wasn’t hockey it was just egos moving around on the ice. Hockey is a great sport that is occasionally marred by a very volatile culture. Unfortunately, those incidents make the game distasteful for many and those incidents are too plentiful to be called aberrations. You are correct in assessing that the Code, while unwritten, is widely understood. But it, just like morals, is socially constructed and therefore can change whenever we want them to. I’m not saying this is easy but hockey culture is often referred to as some static entity that unwavers through time – this is the way it has always been and this is how it will continue. We used to think it was morally acceptable to own slaves as well but times changed and so have many moral beliefs. The game of hockey has changed quite a bit, yet the culture moves very slowly. Maybe it’s time to play catch up. I think this is a good time to end this conversation. So far, you have brought up the worst incident of on ice violence in the modern game and slavery. We are one step from the maximum amount of overreaching hyperbole possible. I am not saying The Code is perfect, far from it. But I think it has it’s place. I guess I should now leave it at that. Thanks for the chat.